Adunca refers to the two lower petals of this flower; it means hooked, which describes the way they protrude outward. 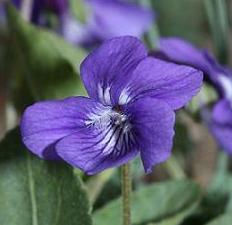 The petals are purple and streaked with dark veins and may vary in color by region. 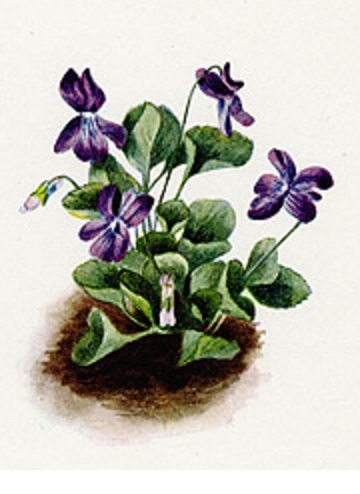 This violet is possibly the most common one found from Alaska across the western United States as well as the upper portion of the east coast, USDA zones 1-9. Violets have become more and more popular in salads and candied for desserts, the purple color make these a nice addition to any meal. 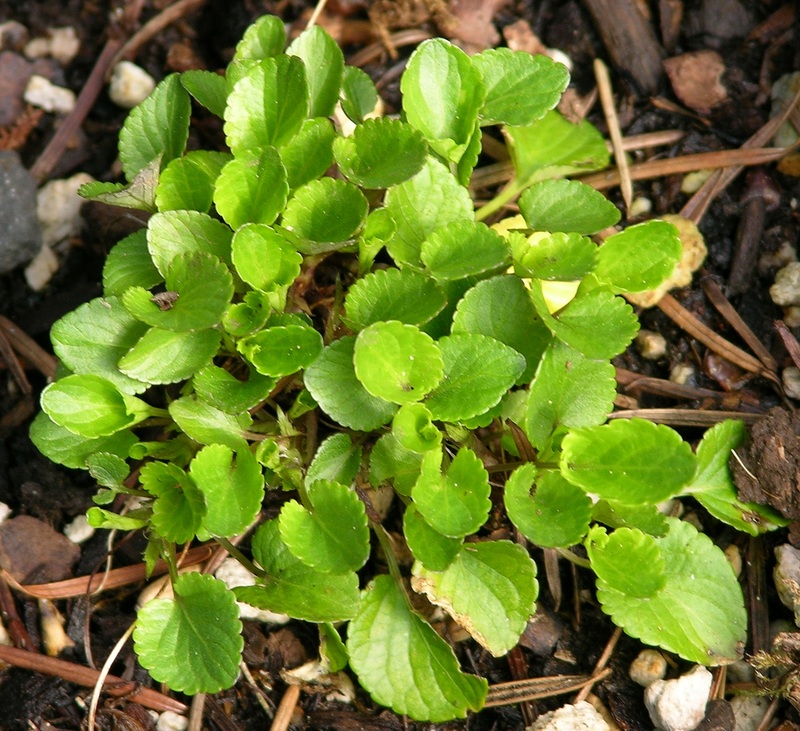 The round leaves are in a basal rosette, and the seed capsules explode allowing the plants to spread. They grow well in moist to average soil and sun to part shade. 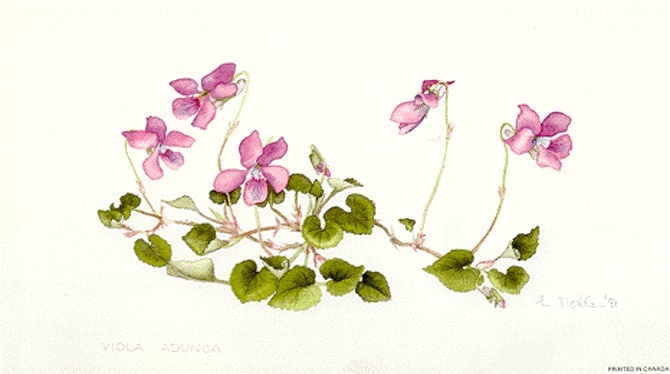 Watercolor painting, below center, is by Lyn Noble, "029 Viola Adunca." See more of her beautiful work on her website: www.botanicalart.ca. Photo below right by Walter Siegmund. This is a reproduction of a Washington Department of Fish and Wildlife document and is not the official document or regulations of the Washington Department of Fish and Wildlife. The accuracy of the reproduction cannot be guaranteed by WDFW. While meandering about in my backyard the other day I noticed the Western Long-Spurred Violets (Viola adunca) were blooming. So small and quiet, it never fails to give me a moment of delight to see them. Their leaves are quite lovely, round and mildly cup-shaped, growing in a circle with the spurred flowers in their midst. Their fragrance is as sweet as their appearance. I love to pick a few and put them in a tiny vase on my kitchen windowsill where I can take a sniff now and then to be transported backwards in time to thoughts of pioneer girls who treasured them as much as I do. But their importance is much greater than our simple enjoyment: The leaves of this precious little plant which grows wild in most parts of the United States and Canada are the sole support of the Oregon Silverspot (Speyeria zerene hippolyta) butterfly larvae. In the past ten years, the number of Oregon Silverspots in Cascade Head Reserve in Tillamook County have decreased from an average of over 1,000 adults to only 57 recorded in 1998. 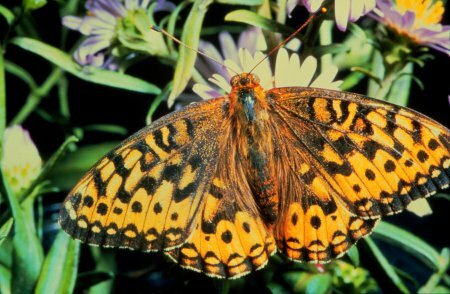 Dangerously close to extinction, a habitat management plan has been developed to increase the likelihood of a natural recovery of this butterfly. Partners in this plan are the Nature Conservancy, the Oregon Zoo and the Woodland Park Zoo. Field fires once burned the grasses that now overshadow the little perennial violets. In suppressing these fires, we have inadvertently allowed the aggressive grasses to all but destroy this seemingly insignificant plant. 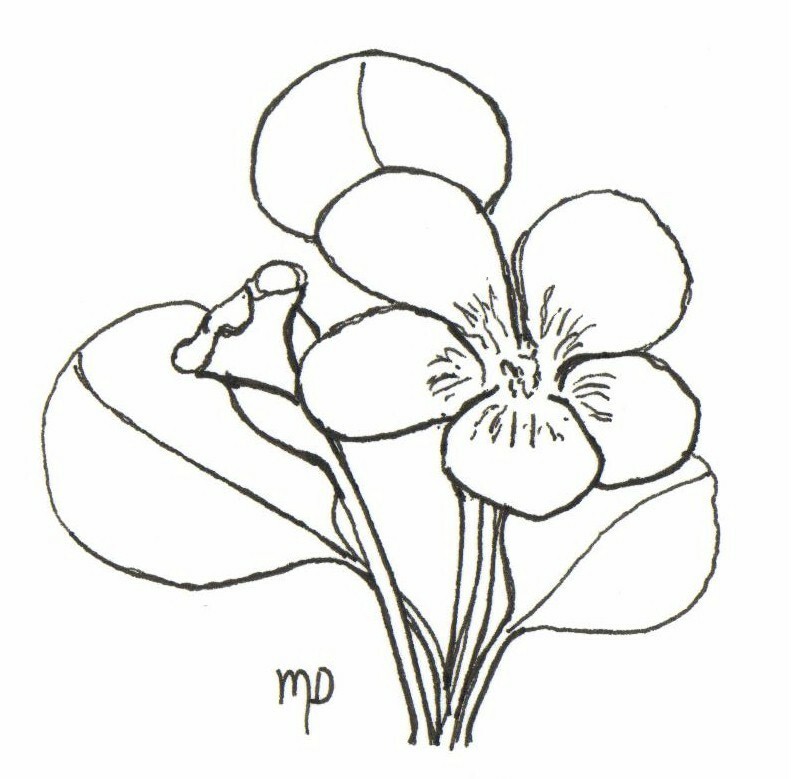 As part of the recovery program, controlled burning is planned to allow the violets to return.